Are these essentials on your spice rack? The brilliance of Asian cooking lies in its intense aromas and bold flavours. At the heart of Asian cooking are the spices that pack flavour and bring depth to your dishes. Here is our list of 8 essential Asian spices that can help breathe new life into your restaurant menu. 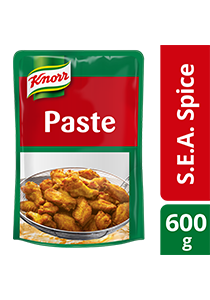 Specially formulated for food service operators, Knorr South-East Asian Spice Paste is made with a blend of good quality turmeric, lemongrass flavour, ginger, garlic and galangal into a paste format for easy application and versatility. A staple in Asian cooking, the possibilities are endless when cooking with chilli. Both green and red chillies are sold in markets, and they can be found either whole or grounded. To incorporate them in your dishes, you may consider tossing chilli flakes with vegetables, use citrus and chilli-infused oils to toss your salads, or even blend them with stir-fried Asian greens. Popular chilli-infused dishes include Japanese Prawns in Ebi Chilli Sauce, Singapore’s Chilli Crab and Thailand’s Sweet Chilli Chicken. For Hunan and Sichuan cuisine, dried chilli peppers are excellent, but for Korean cuisine, the powdered and flaked versions are best. For more of these delicious chilli-infused recipes, see our “Related recipes” section! The Ceylon cinnamon is slightly more expensive than other varieties but has a more delicate flavour. The Chinese cinnamon has a slightly hot and spicy taste. The Vietnamese cinnamon is known for its spicy and sweet intensity. The Indonesian cinnamon is most commonly used because of its balanced flavour. There are plenty of ways to use cinnamon, some include flavouring Middle Eastern lamb, or in aubergine and rice dishes. Found in all kinds of dishes, from Teriyaki Salmon to assam fish curries, ginger is another key ingredient you should have in your kitchen. It can be purchased in both root or powdered form. The Japanese even pickle it to accompany their sushi. Ginger has some medicinal value, so you should try including it in your dishes whenever possible. We’ve seen some really interesting ginger-infused dishes created by chefs, including Pumpkin Ginger Nut Muffins, Ginger Pineapple Fried Rice, Pork Chop with Ginger Pear Sauce, and even in cookies! Ginger’s unique scent and taste make it especially good for sweet snacks. Try this Summer Fruit Salad with Pesto Ginger Dressing recipe and experience for yourself how ginger can truly elevate the flavour profile of a dish! Well-known as one of the spices in Chinese Five Spice, star anise is a perfect complement to chicken, duck, beef and pork dishes. Incorporate it into your menu with dishes like Fried Rice, Mango Biryani, Vegetable Korma, Honey-Glazed Pork Belly or Chinese Gingered Chicken. The slightly smoky, liquorice-like flavour of star anise may be an acquired taste, so use it sparingly to lightly flavour your dishes (so it doesn’t overpower the other flavours). Try this delicious Pork Belly with Beetroot and Honey Raspberry Sauce and see how star anise helps enhance the flavours in a meat marinade, or this delightful Herbal Bak Kut Teh recipe that shows you how star anise can work in a soup. Thanks to its distinctive aroma and flavour, cumin is the go-to ingredient when preparing rubs for meat, marinades, soups and slow-cooking meat dishes. If you are an adventurous cook, try experimenting with black cumin, which has a more complex flavour. Its seed is smaller and recognisably different from other types of cumin because of its black hue. Black cumin is used in many North Indian curries and Middle Eastern dishes. Traditionally, it has also been used for its healing qualities, such as aiding digestion and breathing while strengthening the immune system. So how exactly can you incorporate cumin into your dishes? Try adding cumin to eggplant, dahl dishes or even tamarid chutney! Have a go at this delicious Mutton Meatballs with Peanut Sauce recipe and see how cumin can enhance the flavours in a sauce! The galangal root is slightly bigger than ginger and paler in colour. It also has a more peppery taste. It’s a staple in Thai cooking, along with the all-time favourite lemongrass. Try using them to create a refreshing lemongrass-galangal tea or the popular Tom Kha Gai, otherwise known as Thai Coconut Galangal Chicken Soup. Want to infuse galangal root into your dishes? Try this delicious Grilled Spiced Lamb Rack with Peanut Sauce recipe or Hainanese Chicken Rice recipe to discover how galangal root can really intensify the spice level of your dishes! Well-known for its distinct colour and aroma, saffron is one of the most prized spices in the world. When looking to purchase saffron, look for the ones with a brighter and more intense colour, as it signifies a stronger aroma. Saffron can add colour and flavour to any rice, pork, fish, or Indian biryani meal. An essential ingredient in curry powders, turmeric is extremely crucial in well-loved dishes like Malaysian Rendang, satay sauces and Indian Dahl. Consider adding turmeric to your menu with dishes like Chicken Khao Soi, Tandoori Chicken, Massaman Curry or Honey-Turmeric Pork. Its distinctive colour will definitely make your dishes look more appealing. Turmeric also has many proven health benefits. For example, it acts as an anti-oxidant and has anti-inflammatory properties, among many others.